An independent report (PDF) by the Fair Labor Association (FLA) has concluded that work and safety conditions have improved at many of Foxconn’s factories, with 79% of the remedial actions suggested in their initial assessment now completed. The changes come in response to reports of suicides and unsafe working conditions at several of Foxconn's sites earlier in the year. At the time, the Taiwanese-owned group was accused of ignoring its obligations to provide a safe working environment for its workers and the resulting public backlash led Apple CEO Tim Cook to visit Foxconn’s Zhengzhou iPhone manufacturing plant. Following the visit he asked the Fair Labor Association to investigate further. Their latest report says Foxconn is ahead of schedule with implementing its recommendations, which include health breaks and additional measures to reduce potential for repetitive strain injuries, among many others. Out of the 360 violations reported across its three factories in Chengdu, Guanlan and Longhua, 195 were resolved by the May 31 deadline. Foxconn also completed 89 of the remaining 165 remedial actions due by July 1, 2013. “The next phase of improvements will be challenging for Foxconn because they involve major changes in the working environment that will inevitably cause uncertainty and anxiety among workers. As Foxconn prepares to comply with the Chinese legal limits on work hours, consultation with workers on the changes and implications will be critical to a successful transition,” FLA president Auret van Heerden said. One major concern is the reduction of working hours at the factories. Chinese legislation allows employees to work 40 hours per week and a further nine hours of overtime. 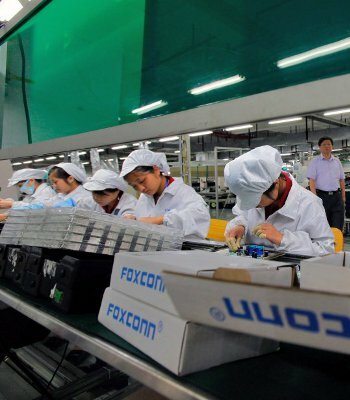 Foxconn has taken steps to reduce them, but they remain high at 60 hours, including overtime.